The MSL field has been narrowing for some weeks, and yesterday marked two bo3 series that would determine the first two semi-finalists. There were big names everywhere, and the MSL is really showing that it holds the star power compared to the OSL. A quick update on the past week: On Oct. 3rd there were games on a special day to accommodate some gamer’s schedules. There are 3 of the four games posted on the tracker. Here are the results of the two bo3 series. Nal_rA advances to the round of 8 final, while Yellow[ArnC] goes to the survivor league. Silver moves on to the round of 8 final, while DaezanG is back to the survivor. Group A featured two gamers who have been steamrolling the competition. Jju, the captain of the Samsung team, has been in top form for quite a while now. He has established himself to be a force not only in the ProLeague, but in the individual leagues as well. His leadership has helped his teammates excel, and brought positive results to his team. Straight Zerg entered the game with a modest 6-6 record against terran in the MSL, and his overall record is also hovering around the 50% mark. The Perfect Terran had similar overall statistics, but with many more games played, and a 17-11 record vs zerg. Opening positions featured Jju on the right and CJ star Xellos on the left. Jju’s scouting lord went south rather than left, looking for any kind of proxy. Xellos had nothing of the sort in mind though, as he blocked his ramp to prevent any scouting inside. Jju took his natural, dropped his pool and gas, and was completely oblivious to the one marine expo build that Xellos started once the scouting drone left. A fast lair from Jju was at his expo even before the hatchery creep had a chance to spread. While Xellos built a second rax, academy, and many expo scv, his scout snuck up the zerg ramp and saw the two hatchery spire tech of Jju. He immediately started his ebay and another rax, and looked to be in good position with his superior scouting. Jju meanwhile expanded to the lower right corner for a third gas and saved his larvae for mutalisks. Although Jju’s surprise two hatch muta strategy had been foiled by the scouting of Xellos, he continued to simply mass his fliers and harass sparingly. Xellos had built numerous defensive structures, but the moment his MM army left the safety of those structures, Jju pounced and his mutas destroyed the initial force. 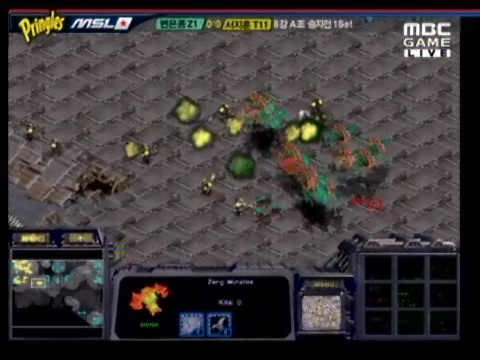 From that point on, Jju was able to attack move his mutalisks into the terran base where only tanks were waiting. They don’t shoot up, and soon Xellos had lost his natural expansion and production buildings. GG soon followed. Xellos should have scanned more and moved out less. This was a perfect example of what attacking blindly can cost you. Well played by Not-gay-zerg. Even though zerg has won double the games terran has in the TvZ matchup on Arcadia, the 6-12 record is actually an improvement over the past believe it or not. Xellos was still fighting an uphill battle to continue this series though. 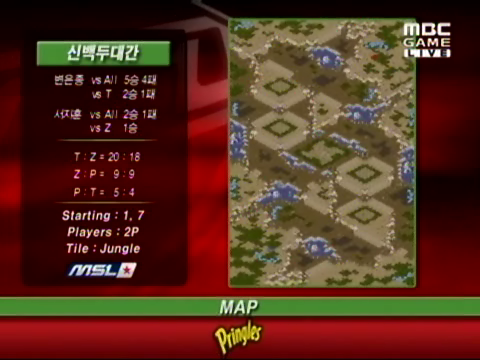 The players opened at cross positions with terran taking over things at 5 and zerg at 11. Both players abused the long distances to take advantage of Arcadia’s easy money. After some nifty ling scouting, Jju dropped the new map standard 4th hatchery before lair and followed it with lurker tech. As Xellos patrolled the middle of the map with his MM, Jju tried to contain the terran with his lurkers and procure another gas at 7. Feeling the need to hinder Jju’s map control, Xellos moved straight through the middle with a large MM tank army. 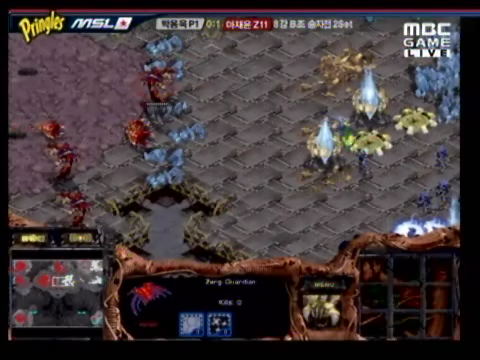 Jju got scared, and through everything he had at the Perfect Terran. It failed. Although he now had defilers, Jju was forced to deal with a huge terran tank army that was blasting apart his hatcheries. In addition, dropships were stabbing his economy in the back at 7, and it was impossible for him to mass anything. He tried to reestablish himself at 7, but it was too little, too late. Jju threw away the game by trying to stop Xellos before defilers. He was a mere minute away from them, so I am not sure about his reasoning. Whatever it was, it was the wrong decision. Who could have imagined after last season that this map would become one of the most balanced maps around after some (major) changes? Good job regardless, as OGN made a good decision about sticking with the overall concept. Things got going in the third and deciding game as Xellos collected minerals at 6 and Jju pooled first at 12. The lings came charging down the map quickly, but Xellos had enough rines and a brave scv to block so that there was no admittance to his ramp. As Jju dropped a third hatchery, Xellos was already finished his academy and second barracks. The aggressive build forced Jju to spend on sunkens while his lair got underway. The money was well spent, because once his second wave of recruits joined the main force, Xellos went all-in. His attack failed, and Xellos looked visibly upset. With Jju having almost completed his spire, Xellos would have a tough job defending his new expo and main with diminished troops. As Jju harassed with his mutalisks, he also expanded to 11 and 2 while whoring unbelievable drone numbers. Xellos continued to be purely on the defensive, but had miles to go if he were to catch up. A greater spire was already halfway done, and with 4 gas, it was now or never for Xellos to make a dent. As he attempted to move through the middle, Xellos was stopped cold by a combo of guards, defilers, and lurkers. He negated the air threat with a nice pincer move, but the yellow creep was overtaking the entire map, and defilers pushed his defenses up against his expo wall. Rich as a lord, Jju simply sent waves of troops against the terran defense. Under the dark swarm, there was little Xellos could do to stop it. He stayed stubborn for a bit, but the end was never in doubt. Jju capitalizes again on a blunder by Xellos, and this time it earned him a trip to the final four. Xellos will face Nal_rA in a best of 5 match next week. That one should be fantastic! Group B featured gamers with the same great caliber as Group A. In the days second series, two-time champion Savior took on the new SKT1 captain, Kingdom. Kingdom is carrying a lot of pressure now that Boxer is gone, but he has been showing excellent results lately. Kingdom is great vs Z, going 10-6 in the MSL. 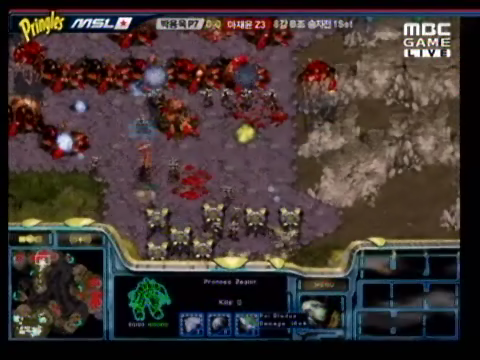 ON THE OTHER HAND, SAVIOR IS THE WORST ZVP PLAYER IN THE HISTORY OF THE UNIVERSE (18-5). Considering the MSL is where he has had the most success, you would think the record would be stronger. The three player map Longinus was the stage for the first battle. Kingdom (@7) opened with two gateways at his natural and scouted Savior (@3) very quickly. However, Savior had pooled first, and his early lings were enough to deter Kingdom from charging in right away. While Kingdom quickly started a third gateway, the Maestro took his natural and an out of the way expo at 12. Savior had no sunken colonies, but was using all of his larvae for lings. 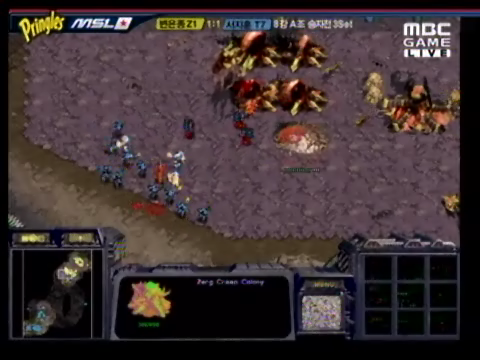 As a result, Kingdom’s first foray to the zerg base quickly turned into a suicide mission. Still without gas, Kingdom decided to expo while Savior contained him with mass lings. Soon lurkers were added to the blockade and Kingdom had a long ways to go before observers were ready. Having the map to himself, Savior promptly got comfortable. He teched fast to hive, dropped multiple hatcheries in his main, and by the time Kingdom shot his way out, the defense at the zerg main and 12/11 was an impenetrable maze of lurkers and sunken colonies. Savior continued to take more of the map, and although Kingdom had established a powerful army, there was nowhere to attack. Eventually he got frustrated at attacked at 12. Savior was once again in the right place at the right time, as 8 guards hatched just in time over the cliff, and a crackling flank took care of the rest. Kingdom took one more stab at moving out, but with mass ultra ling, there was no doubt. If you are attacking that… it is because you have nothing better to do. Looking for a better showing this time, Kingdom scouted fast with his probe, and managed to delay the zerg expansion nicely. 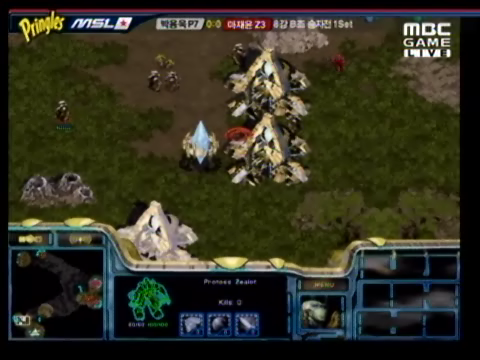 Savior had once again pooled first, but the SKT protoss was in no danger of losing his ramp as he teched fast and hard. His corsair quickly took wing, and templar tech was also in the works as Kingdom took his expo. Savior defended nicely against some light dt/sair harass, and tried to mine out the middle wall for a frontal attack. Kingdom prepared against it by building some cannon fortifications and storming drones as they came to mine. Being the smart boy he is though, Savior kept feeding drones to the storms, and when he counted four or five go off, he charged his hydra around the map and landed a nice body blow on the protoss expansion. Kingdom dealt with it, but it cost him dearly. Amidst all the fun, Savior had managed to make a space in the mineral wall, and was now happy to attack on two fronts as Kingdom tried to keep his expansions alive. While protoss forces were already stretched thin, Savior opened a third front by hydra dropping the main base, and a fourth by lurker dropping Kingdom’s middle expansion. Deviltoss handled all of this, but it was pushing him to the brink. Meanwhile, he had yet to apply any real pressure on his opponent all game. This uncharacteristic lack of aggression by Kingdom was obviously not going to go unpunished. As he tried to create a robotic army in the center, he was constantly plagued by air attacks, drops, and harassment from every angle. Hatcheries spawned all over the map, and soon enough there was too much to attack. GG. Savior is beyond good. When he wins, it is because he has removed all chance of his opponent doing damage to him. Who can stop him? Tonight’s recommended game is Kingdom vs Savior game 2. It showcased amazing attacking by Savior and equally good defending by Kingdom. You can download it from our VOD tracker. Next week we will see some more great matches. Xellos vs rA and Kingdom vs Silver. Thanks for reading. I was dissapointed in Xellos's play, it seemed too risky with some bad judgement. I still believe in Kingdom's ability to hit top 4 again. Thanks for the report mani. The Maestro ftw, and a good read too! Now that fake yellow is out of [name] why doesn't he just get his own ID now? I hate him. is it on youtube or crunchyroll by any chance?? saaaaaavvviorrrrrr <3. Love that guy, he just... dominates or goes down without any flare at all hehe. Best guy. 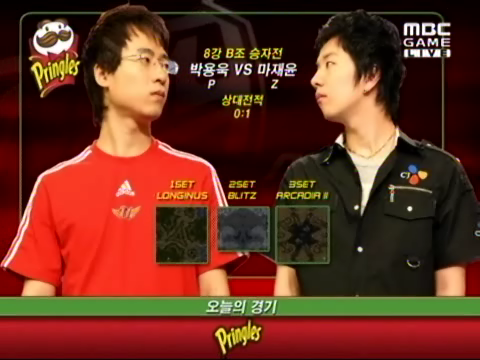 His protoss vs Zerg is rediculously high, like 80 percent. I wonder if it will be another savior vs nal_ra final. Was there ever a final with both the same players in a row? I think NaDa vs YellOw was twice? First game savior vs kingdom sucked hard. Mass sunkens? Where's the style of a world class player in that? What are you talking about? That was really good! !